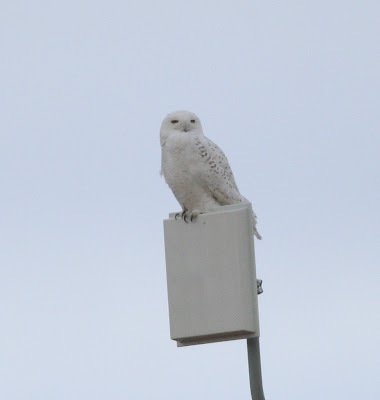 On the 23th of January, we chased the Snowy Owl in Peyton, Colorado with our neighbor Davis. 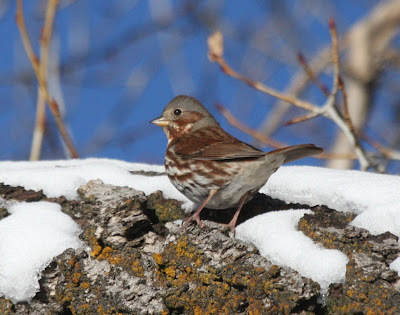 This bird was found around Christmas, and has been predictable ever since. 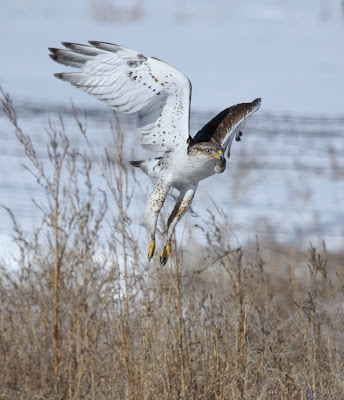 On the long three-hour drive we looked at all the raptors that were perched on the power poles, most of them were Red-tails but a few of them turned out to be Ferruginous Hawks. 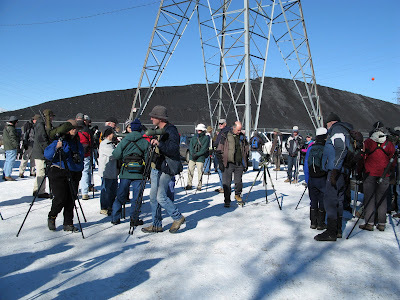 When we arrived at our destination we started searching around the subdivision that we thought the Snowy Owl was being seen in, but after an hour of searching, we never found the owl, or the hordes of birders who are said to follow the bird. So, we decided to read the written directions instead of following Davis’s GPS, which was how we got to this locale. As it turned out, we were in the wrong neighborhood. 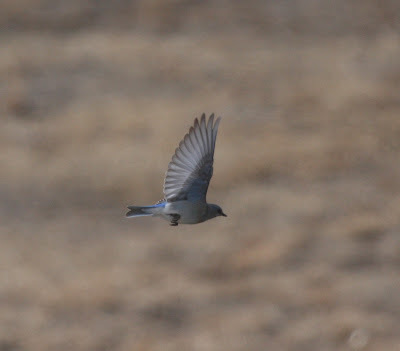 We did manage to find a wintering flock of Mountain Bluebirds during our wanderings, which was great. Upon arrival at the correct neighborhood, we spotted the owl almost immediately. 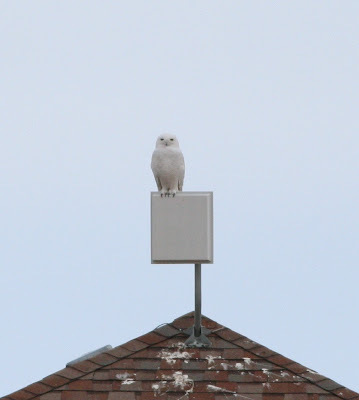 The large, chunky, snow-white, yellow-eyed owl that should be hunting the arctic thousands of miles north of here was perched on top a white structure, and, as Davis said, "That can't be the owl . . . it can't be as white as what it's perching on!" 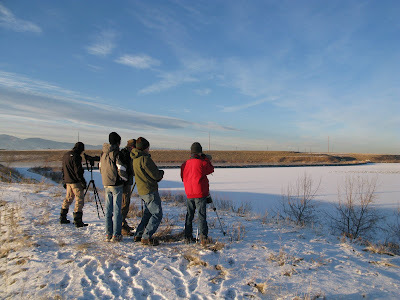 On the 16th of January, we participated in the Indian Peaks winter bird count!!! 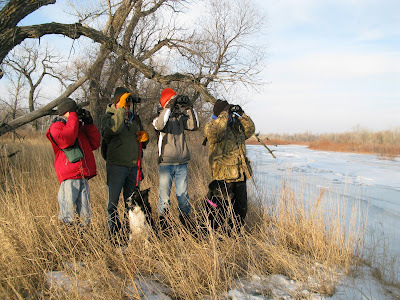 This winter's participants were Bill Kaempfer, Todd Deininger, Gary Matthews, Marcel and myself. We split up into two groups . . . Todd, Marcel, and me in one, and Bill and Gary in the other. 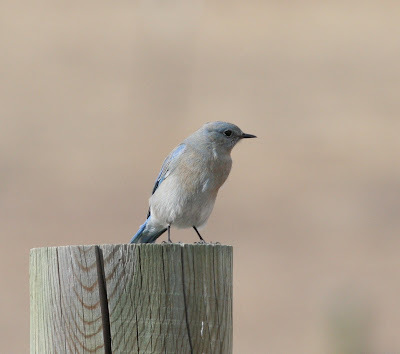 Our group first stopped in Ward and checked out some bird feeders and saw Steller's Jays, Mountain Chickadees, and Dark-eyed Juncos. 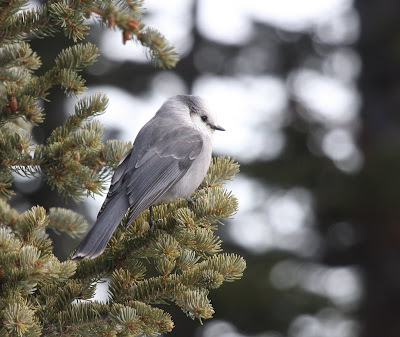 We next winded up a mountain and stopped at the Brainard Lake trailhead where we hiked around and found two Gray Jays at the trailhead hoping for handouts. 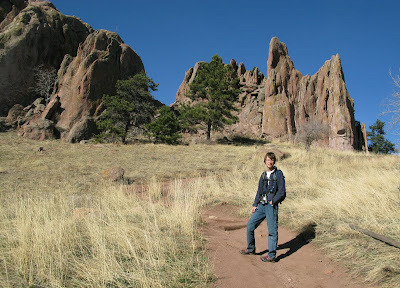 After that we walked around Spring Gulch and drove around on some roads looking for nuthatches, crossbills, etc. We were successful in finding Pygmy Nuthatches, an American Robin, a Townsend's Solitaire, and one Red Crossbill. 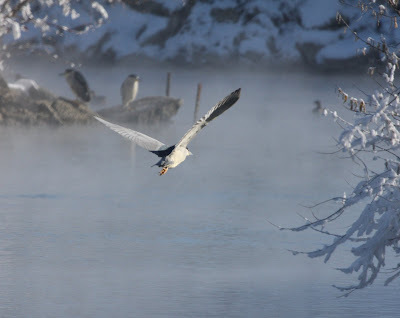 After joining with the other group we drove to the Gold Lake Resort and saw several juncos and a Gray Abert's Squirrel. The other group said that they saw Pine and Evening Grosbeaks in Ward at one of the bird feeders so we returned in hopes of seeing them. 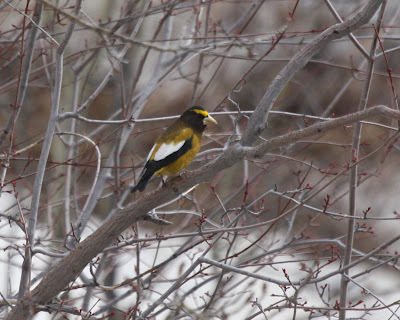 We saw the Pine Grosbeaks and only one Evening Grosbeak. 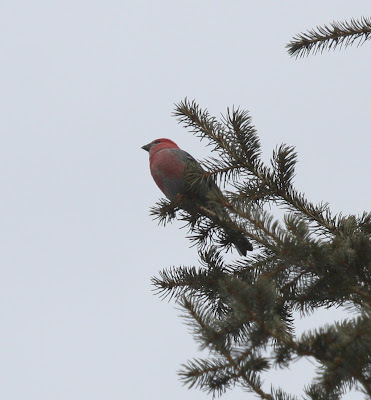 We also saw Red Crossbills and a couple Red-breasted Nuthatches. 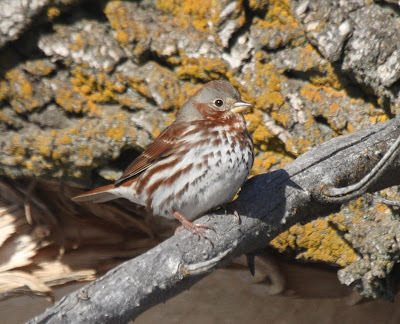 We decided to go to Allenspark to see if we could find rosy-finches. 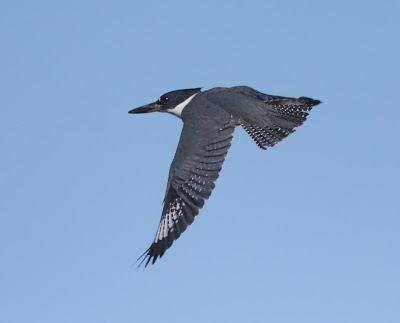 On the way, we saw a Rough-legged Hawk flying over the road, a Belted Kingfisher on a power line, and Clark's Nutcracker on the hillside. 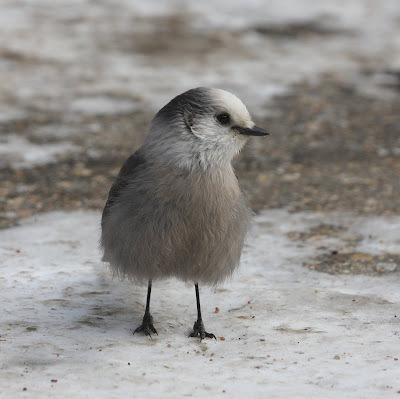 When we got to Allenspark, we saw a male and a female Pine Grosbeak along with Mountain Chickadees, Steller's Jays, Black-billed Magpies, a Common Raven, a White-breasted Nuthatch, a Hairy Woodpecker, and a Northern Shrike, but no rosies today. 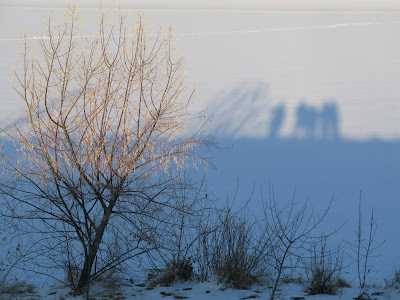 I, Marcel, had the pleasure of being one of the sub-group leaders for the annual ABA/CFO/DFO/BBC Valmont Reservoir Complex field trip on January 9th. 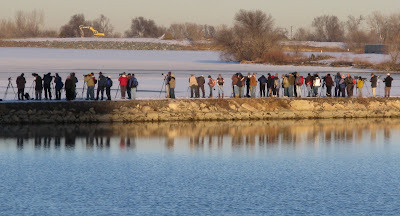 Generally closed to the public and holding some of the only open water in Boulder County in the midst of winter's freezing temperatures, Xcel's Valmont Power Plant opens its gates to birders once a year . . . a special thanks go to plant engineer, Dave Madonna and Ted Floyd for organizing it! 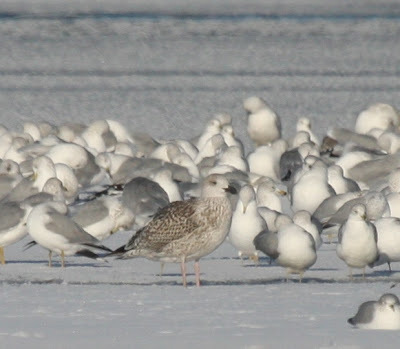 The turnout was even better than usual, perhaps because our Jan. 8th scouting trip yielded a second-cycle ICELAND GULL in the local gull roost, along with some other good gulls, including a first-cycle Great Black-backed Gull. This is one of the few birding events that begins at noon, as one of the real goals is to watch the influx of gulls in the late afternoon. 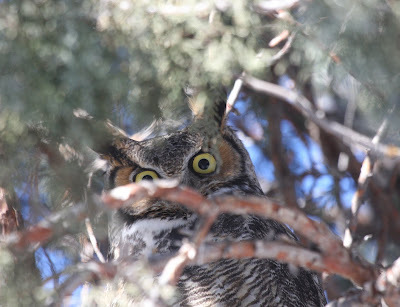 My group started out with great views of the two local breeding Great Horned Owls who were roosting in a large cedar. Almost as soon as we got to the first of the three reservoirs, Leggitt, two adult Black-crowned Night-Herons flew by. 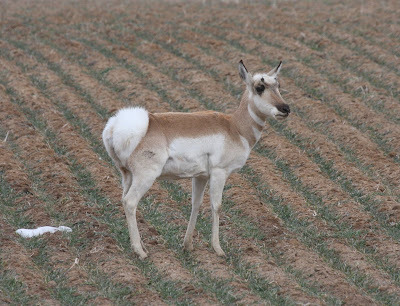 These are a winter specialty at Valmont, as most leave for warmer climates during the colder months. 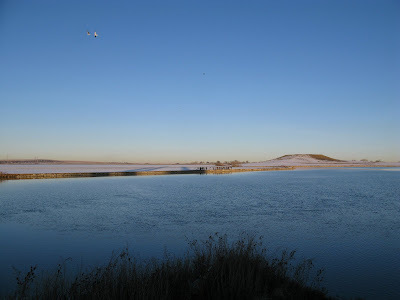 For the first couple hours of the trip, we concentrated our efforts on the many ducks and geese which inhabit these reservoirs, plus the passerines in the plentiful Russian-olive trees. 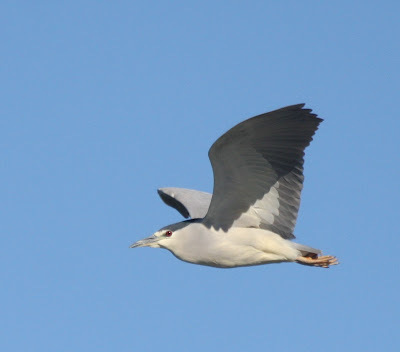 But, later in the afternoon we directed our attention to the hordes of gulls, mostly Ring-bills and Herrings, which were now streaming in from their day jobs, i.e. McDonald's parking lot cleaners, quality control at the county dump, and other such jobs. Among one of the first fly-ins, around three o'clock, was the immature Great Black-backed Gull. Birders lined the causeway, watching waves of gulls continue to stream in through the rest of the afternoon. 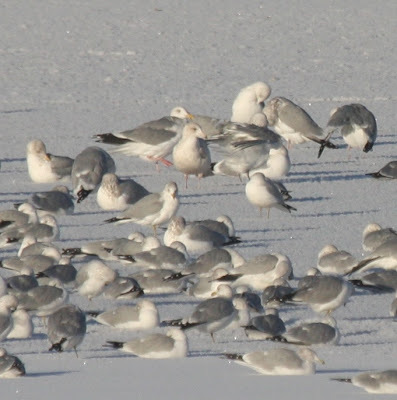 In one of the later flocks was the prize, the second-cycle "Kumlien's" Iceland Gull! 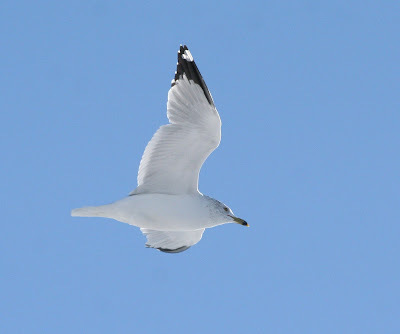 Also among the gull count was a few Lesser Black-backed Gulls and Thayer's Gulls, and a couple of California Gulls. We ended the day with a pending total of over 60 species of which 7 were gulls, a great number for a chilly mid-winter day in Colorado! Other highlights seen were a male Mandarin Duck, a Clark's Grebe, a "Prairie" Merlin, and a Rough-legged Hawk, not to mention great views of Bald and Golden Eagles. Joel Such scout Valmont and lose feeling in their toes. 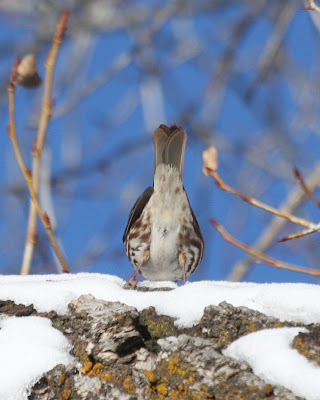 On January 1st we were surveying the yard birds when a Red Fox Sparrow made a brief appearance below the feeders. Marcel kept his eye on the bird's general location, while I ran for a camera. 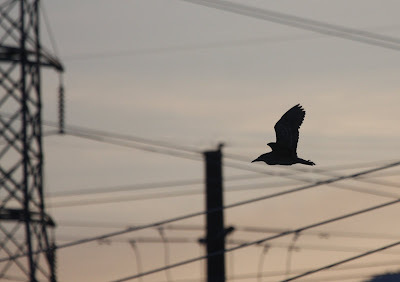 The bird flew off before I got back, so I took off in pursuit of it. I relocated it upstream where it was drinking water from the creek. 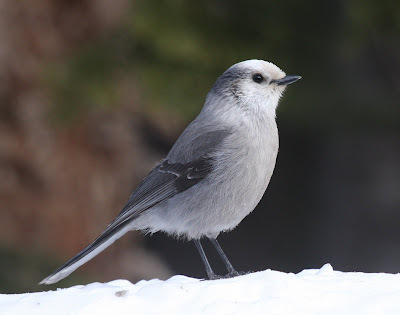 It flew up to a small cliff face and hopped through the rock crevices before flying into a ponderosa pine and then flying on and disappearing for good. 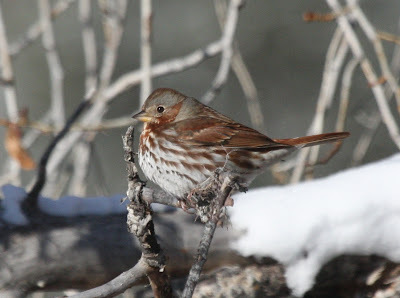 Today, January 8th, the Red Fox Sparrow was again spotted feeding on the ground below our feeders. 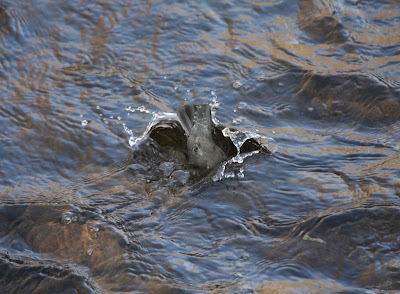 After a while, it flew upstream. 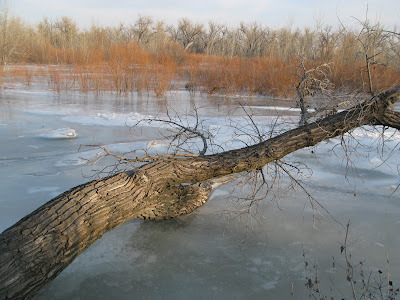 I followed it and found it in the cottonwood tangle where it was hopping up a massive cottonwood. The light was great and I finally got some good photos of this new yard bird. Today we did the Longmont CBC with Maggie Boswell, Deanna Williams, and Nic Berndt. We had the same area as last year. 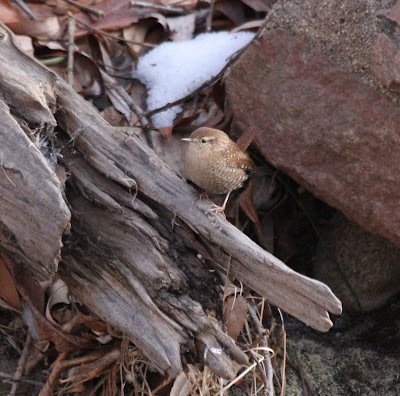 The hands down best highlight of the day was an "Eastern" Winter Wren (it's going to be split from the Pacific race - Pacific Wren - sometime in the very near future), which we re-found along the Saint Vrain River. 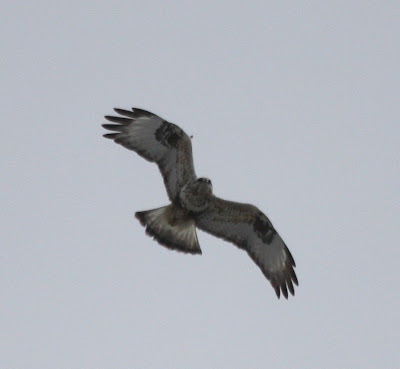 Also up in the highlights was a juvenile "Harlan's" Red-tailed Hawk (another candidate for a possible split someday) that Joel and I found at Pella Crossing. We ended the day with 34 species . 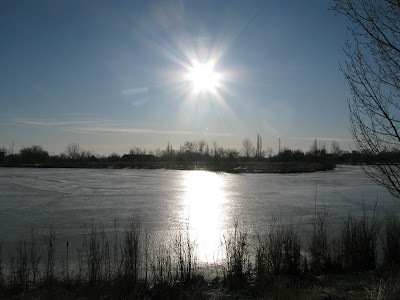 . . not a bad total for a mid-winter day in Colorado with no open water! before linking up with the other members of our team. Today we participated in the 100th anniversary of the Boulder CBC! 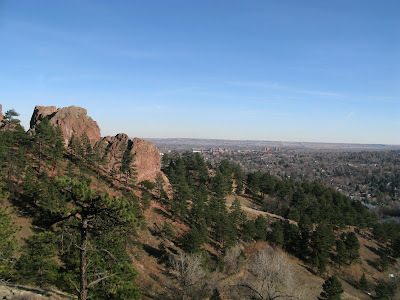 Joel and I led a territory this year, Mount Sanitas. Check out our previous blog post for our scouting report. Yet again, we got another obvious highlight, a small flock of Western Bluebirds which we found just as the sun was dipping below the horizon. 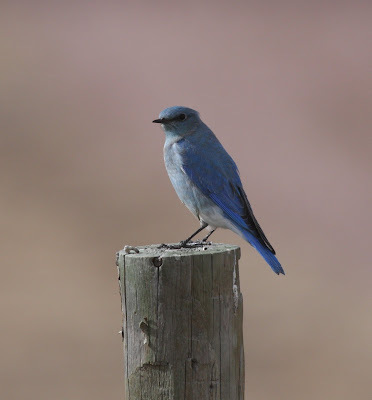 By no means rare during the summer, this species is quite noteworthy during the winter in the northern Front Range, with most of the bluebirds having gone farther south (and east). 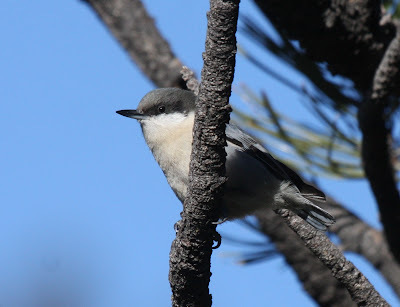 Also among our highlights were two Western Scrub-Jays, two Canyon Wrens, seven Spotted Towhees, and eight fly-over Red Crossbills (type-2, for those interested). We ended the day with 27 species and covered about 11.5 miles of trails plus about 7 miles by car. Today we participated in the Crook CBC, out in the far north-eastern corner of Colorado, with our good friend Ann Wichmann. 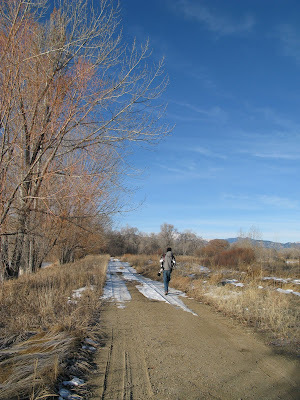 We were assigned the western side of Tamarack Ranch State Wildlife Area. This brought up an interesting question . . . do you or do you not count the occasional goose that would fall from the sky courtesy the hunters lurking in the woods? By about nine o'clock in the morning, after we had been tromping around for a couple of hours, the birds finally started waking up. 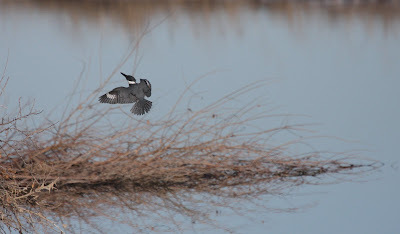 Being this far east, there were possibilities of some good eastern specialties, such as Northern Bobwhite, Northern Cardinal, Red-bellied Woodpecker, and Eastern Bluebird. 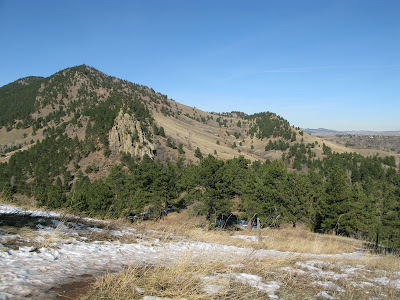 While hiking through the area, Ann would occasionally send her Black Lab, Lance, out into the surrounding brush to try to flush a covey of bobwhites or Wild Turkey. This never succeeded, but it was still fun trying. We never did find a cardinal, but we did find a couple of Red-bellied Woodpeckers and Eastern Bluebirds. 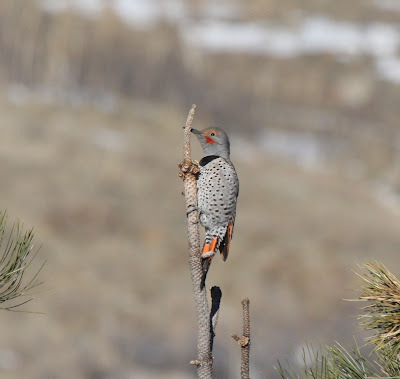 Other highlights included a Snow Goose plus a "Yellow-shafted" Northern Flicker. We ended the day with 35 species.